Dani Johnson review – from homeless to multimillionaire. We all love stories and Dani Johnson has a very unique story to share. Dani grew up on welfare in a very dysfunctional home. than $3 to her name, at the age of 21. The cards she had been dealt weren’t pretty. It was definitely a losing hand by every stretch of the imagination. But that was just the beginning of Dani Johnson’s story because, while still homeless, she found network marketing… embraced a mentor and a coach… attended a live training event… learned a few skills… and went on to earn her first million in the industry by the time she turned 23. Today Dani is the president and founder of Call to Freedom International, operates five profitable businesses, recently appeared on the hit TV show Secret Millionaire and is, herself, a multimillionaire. How’s that for a fairy tale ending?! My journey into Dani Johnson’s world because almost 10 years ago after my sponsor in a health and wellness opportunity told me to get hold of her best-selling Script Book in order to learn the art of “what to say and how to say it” when it comes to prospecting on steroids. So I pick up the script book and a bazillion business opportunity seeker leads and just got busy. In the beginning I pretty much sucked, but eventuallystarted to enjoy the results of taking consistent action over time and I was so impressed with Dani’s ability to teach these life-changing, wallet-busting skills I made it a point to attend a First Steps to Success event. Within a year after attending that event and picking up a few of her other CDs, Lisa and I were able to earn our first six-figures in the network marketing arena. In other words, my “Dani Johnson review” is two thumbs up. Way up! As I shared in another post, attending mlm events is critical to the success of your business for both you and your team. Because there is something about the power of the mastermind and the power of being in a group of people who share like dreams, goals, challenges and aspirations. Not to mention the training you receive and the connections you make. When I attended Dani Johnson’s First Steps to Success event almost 10 years ago, little did I realize then that would open the door later to actually coach and mentor with Tom Challan, which led to working with Jerry Chen and a host of other leaders in the industry. But let’s get back to this Dani Johnson review, shall we? 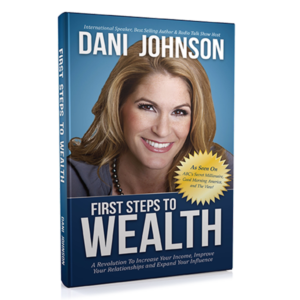 Dani recently sent me an advance copy of her newest book, First Steps to Wealth. The book is absolutely incredible and I highly encourage you to run, don’t walk, to pick up a copy and study it as your financial future counts on it. Because it does. It really does! For example, I’m just going to pull out one TINY BIT of experience that Dani shares in this book she credits for making all the difference in her story of going from broke to superstar. It’s profound and if you GET IT, I’m confident it will have a dramatic impact on the success of your business as well. Dani shares she struggled for six full months in her new business without enjoying any success. Then she met a guy who had started building business at the same time and was having dramatically different results. In fact, after only six months of being in the business, this guy was earning well over $15,000 per month. So Dani asks him if he would teach her to do what he did. If you give me one excuse, I will not work with you. We all have opinions and we tend want to share them with everyone. But Dani’s mentor realized that most of us use opinion and make suggestions to order to simply sound like we know more than we do, versus actually doing something. You give me any opinions or suggestions and I will not work with you. Sounds harsh, but what he was saying is that he was making money. His system and methods worked. Hers did not. So until she was producing the same results he was, or better, zip the lip and simply do what you are being coached to do. Dani insists this is the second most powerful business strategy she has ever learned (we’ll talk about the first in another post!) that helped propel her to millions. If I tell you do to A, B, and C, and you decide to do X, Y, Z, or B, C, A, I will not work with you. Now,I have to say also found the key to success in any area of your life can be a simple as finding someone who is having the results you want, finding out what they do, and simply doing the same thing. Yet we tend to want to change things, to do things our own way and to find a shortcut or something. Then we walk around frustrated and wonder why we aren’t enjoying the same results. Why not decide to actually be TEACHABLE and COACHABLE long enough to produce the result you are seeking and THEN add your own twists and turns? Network marketing is one of those businesses that requires a particular skill set not found in too many other businesses or career paths. There are skills distinct to this industry that must be mastered in order to enjoy incredible success. And the downside is it takes time, energy and often a monetary investment to learn these skills, mindsets and strategies. Are you willing to pay the price, understanding that learning how to be successful is not always convenient? So there you go… that’s my Dani Johnson review.